When you are working with a lot of different tools on your workbench, it can become crowded pretty easily leaving little room for your actual project. 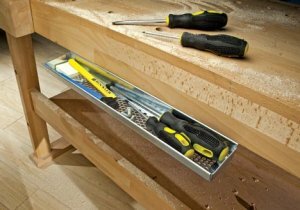 Rockler has come up with a solution as simple as a tool tray that mounts under your workbench. Constructed out of 16-gauge galvanized steel, the Rockler Undermount Utility Tray provides a place that is easily within reach and allows you to keep your work surface clear. Not only can the tray be convenient but it can also save you from accidentally scratching your project on some misplaced tools. The Undermount tray comes pre-drilled and features a perforated bottom so that saw dust and other debris can fall right through. It is priced just under $25 and has an overall size of 16'' x 4-1/4'' x 1-1/4''.